Dark Horse Books, 9781616554316, 208pp. Set in 1932, this is the story of two misfits with no place to call home, who build a relationship during a train hopping journey from the cold heartbreak of their eastern homes toward the sunny promise of California. Pearl "Soupy" Plankette ran away from her abusive father, but has nowhere to go until she stumbles upon a disguise that gives her the key to a new identity. 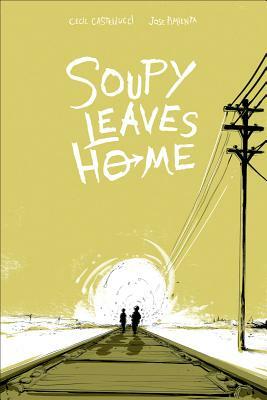 Reborn as a boy named Soupy, she hitches her star to Remy "Ramshackle" Smith, a hobo who takes her under his wing. Ramshackle's kindness and protection go a long way to help Soupy heal from her difficult past. But Ramshackle has his own demons to wrestle with, and he'll need Soupy just as much as she needs him. Cecil Castellucci is the author of books and graphic novels for young adults including Boy Proof, The Plain Janes, First Day on Earth, The Year of the Beasts, Tin Star, Stone in the Sky and the Eisner nominated Odd Duck. Her picture book, Grandma's Gloves, won the California Book Award Gold Medal. Her short stories have been published in Strange Horizons, YARN, Tor.com, and various anthologies including, Teeth, After, and Interfictions 2. She is the Children's Correspondence Coordinator for The Rumpus, a two time Macdowell Fellow and the founding YA Editor at The LA Review of Books. In addition to writing books, she writes plays, makes movies, does performance pieces, and still occasionally rocks out. Born in New York City to French Canadian parents, she is a citizen of both America and Canada. Currently, she lives in Los Angeles. The author lives in Los Angeles, CA.